Pre-teen entrepreneur Maddie Rae at her Play Fair 2017 booth. The Toy Association’s Second Annual Play Fair was not only a great family event but the scene of a Guinness World Record setting event. On November 4, 2017, in what looked like an epic remake of the classic Lucille Ball grape stomping episode, 12 year old Maddie Rae and a throng of more than willing kids thrashed their way to global recognition. 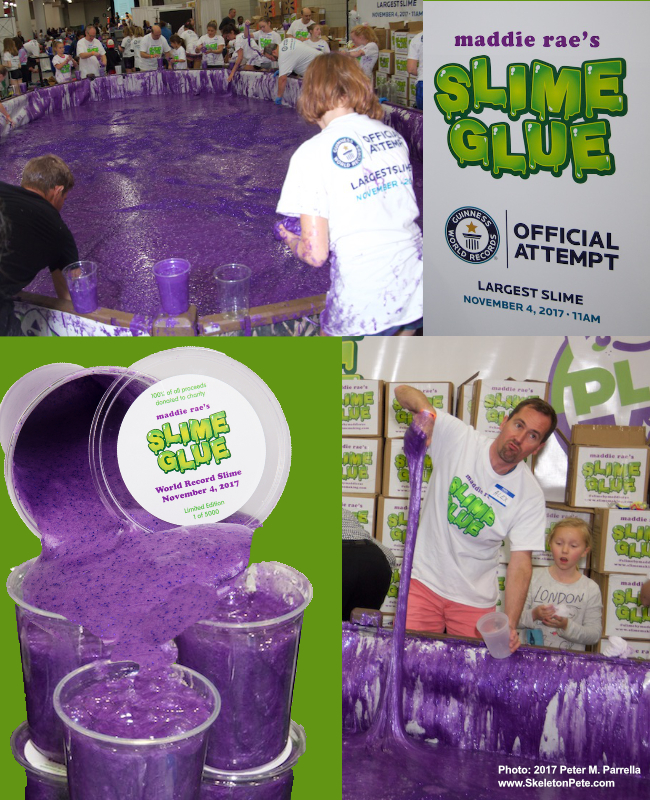 Knee deep in a giant pool of slippery ingredients the troop managed to mix up 13,820 pounds (6,268.64 kg) of Purple Sparkle Slime. The largest amount ever created. Covered toe to elbow in ooze the human blender took just under 2 hours to complete the gargantuan task. Fortunately the slime cleans off easily with vinegar. Weighted Solutions of Texas supplied the truck weights that allowed the massive vat to be accurately assayed. 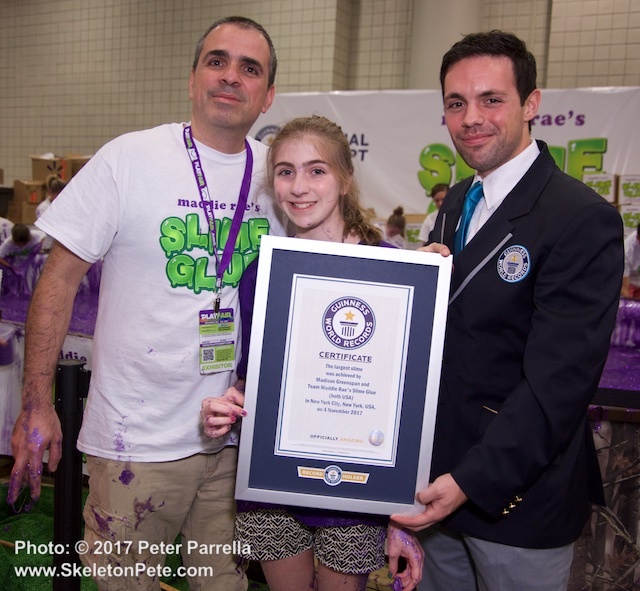 Officials from The Guinness Book of World Records were on hand to confirm the feat and induct Maddie into their rarified ranks. 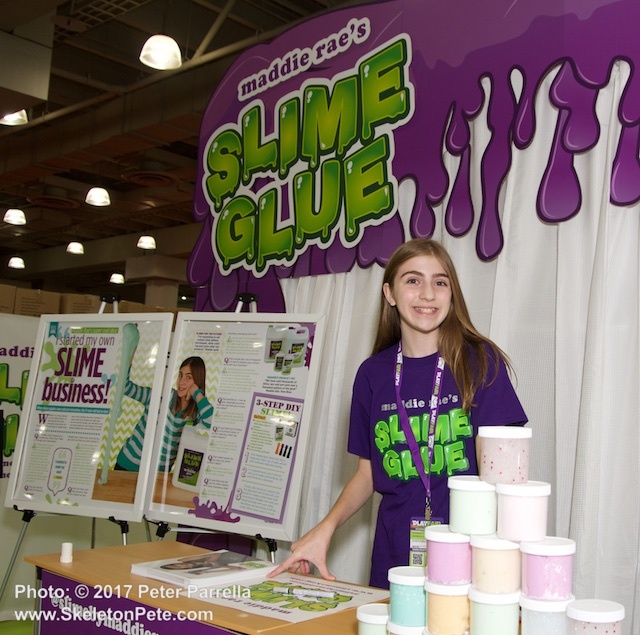 Proceeds from sales of the record breaking slime will benefit hurricane victims. Participants spent the latter part of the two day Play Fair transferring the mix to individual 32 oz containers, each labeled to note its provenance. You can own a piece of history, AND help those in need by purchasing one of the limited containers through Maddie’s Slime Glue Website. 100% of the proceeds from these sales will go the Hand-In-Hand Organization, chosen by Maddie for relief of recent hurricane victims. Maddie proudly accepts recognition of her record setting feat. The young entrepreneur has been marketing her own brand of ingredients to whip up the fun stuff at home in more reasonable amounts. She offers a range of recipes as well as the science behind the viscosity of liquids and polymer molecules at her website. I’m in. Magnetic Slime seems too much fun a project to pass up.